President Donald Trump plans to end a key set of Obamacare subsidies that helped lower-income Americans pay for health care. The White House made it known that the Trump Administration would end the Affordable Care Act's cost-sharing reduction payments. The Act particularly helps people earning between 100 percent and 250 percent of the poverty level pay for the insurance and health care they get. The dramatic move by the Trump administration raises questions about the law's future. Health care experts have warned that not paying the subsidies could send the health insurance exchanges into turmoil. The payments, which started under the Obama administration, had been continued by President Trump but on Thursday the White House said since there was no appropriation for it, "the Government cannot lawfully make the cost-sharing reduction payments." The White House said in a statement: "The bailout of insurance companies through these unlawful payments is yet another example of how the previous administration abused taxpayer dollars and skirted the law to prop up a broken system. Congress needs to repeal and replace the disastrous Obamacare law and provide real relief to the American people." 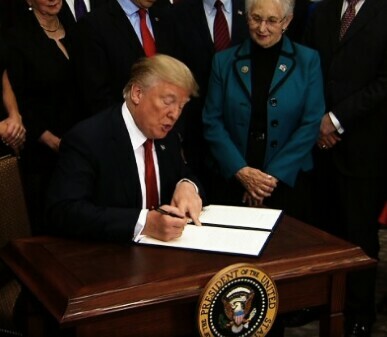 The announcement is part of Trump's aggressive push to dismantle aspects of Obama's signature health law after several failed attempts by Congress to repeal it earlier this year. In a series of tweets Friday morning, Trump called on Democrats to reach out to him to "fix" the law, which he called a "broken mess." Trump tweeted: "The Democrats ObamaCare is imploding. Massive subsidy payments to their pet insurance companies has stopped. Dems should call me to fix!" The news was not received well by Democratic leaders on Capitol Hill. In a joint statement, House Minority Leader Nancy Pelosi, D-Calif., and Senate Minority Leader Sen. Chuck Schumer, D-N.Y., called the move "a spiteful act of vast, pointless sabotage." The leaders said in a statement: "Sadly, instead of working to lower health costs for Americans, it seems President Trump will singlehandedly hike Americans' health premiums. Make no mistake about it, Trump will try to blame the Affordable Care Act, but this will fall on his back and he will pay the price for it." But GOP Rep. Jim Jordan, a member of the House Freedom Caucus, defended the President's decision to CNN's Chris Cuomo on CNN's "New Day" Friday morning. "These (cost sharing reduction) payments are in fact illegal. The President said he is no longer going to engage in making these payments, so let's move forward and do what we should have done a long time ago," he said, later adding, "Obamacare is a mess and we need to replace the whole thing, repeal the whole thing." In a statement issued shortly after Thursday's announcement, House Speaker Paul Ryan, R-Wisc., said the decision "preserves a monumental affirmation of Congress's authority and the separation of powers." "Obamacare has proven itself to be a fatally flawed law, and the House will continue to work with Trump administration to provide the American people a better system," Ryan said.